Pablo Arellano Jr is serious about starutps and entrepreneurship. How serious? Well he just went through Arkansas’ Ark Challenge accelerator with one idea, pitched a different idea (3DLT) at Startup Weekend Cincinnati last summer, is a startup event organizer and the Startup Digest curator for Cincinnati, Arkansas and Northern Kentucky. We met Arellano at Startup Weekend Cincinnati last summer. It was there that his idea for a “99 designs for 3D printing” was born. Naturally with 3D printing being such a hot space it was selected to build over Startup Weekend and they came in second. Arellano kept pushing and while he was in the Ark Challenge program with his other starutp he met the rest of his 3DLT team. They realized quickly they were onto something extremely hot. When Ark Challenge closed out Arellano and his teammates returned to Cincinnati where they are housed at the new Cintrifuse incubator. One of their biggest mentors and advisors is Rob MacDonald, co-founder of Cincinnati’s “The Brandery” as well as the son of the sitting CEO at Proctor & Gamble. In February the team from 3DLT won a spot onto the Battlefield Stage at an event in New York City. From there it went into hyper mode so that they could pull off a great pitch and get ready to serve the public. For their big kick off Arellano is giving away $10,000,000 worth of memberships on the site right now. 3DLT has evolved from a simple place to buy 3D templates to a marketplace for both templates, and eventually goods that a consumer can produce in their home. In the feedback section, David Tisch was concerned that Arellano didn’t talk enough about the business, “Why did you just spend 6 minutes talking about 3d printing and not your business.”. Other than that hiccup the team seemed to have good answers, but overall the truth of the matter is that 3D printing is on fire, just six months ago it was unheard of to have a 3D printer in the home. On the way to New York I saw an at home 3D Printer in the SkyMall magazine for under $1000 and Arellano told me there was a kit to build a 3D printer at home for under $200. The team at 3DLT sees a time coming, sooner rather than later, when people will be able to create products they need or want in the home. Toys, shoes, sunglasses, cups, plates and other items will be cheaper or easier to produce in home rather than travelling down the road for WalMart. President Barrack Obama said 3D printing was a gamechanger, and Arellano didn’t let that slide, a video clip of that speech was in his presentation. If they keep their fingers crossed 3DLT could end up finishing in the top 3. They’re ready for the 3D world and no Zach Sims, there aren’t any other platforms out there like 3DLT, we checked. 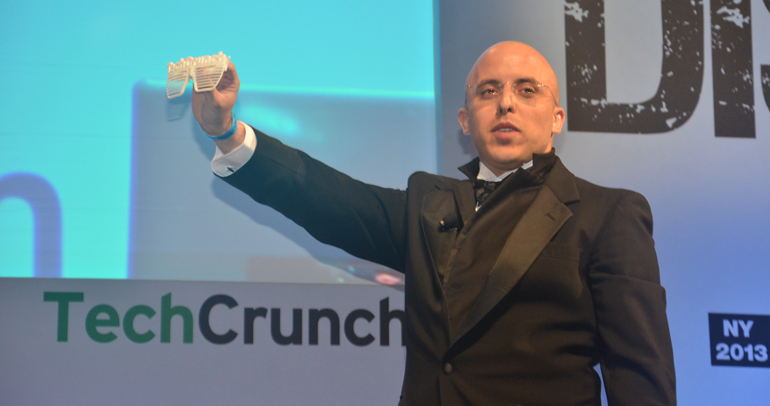 3DLT made it from a Friday pitch at Startup Weekend, to this, pitching on the TechCrunch Disrupt Battlefield stage. 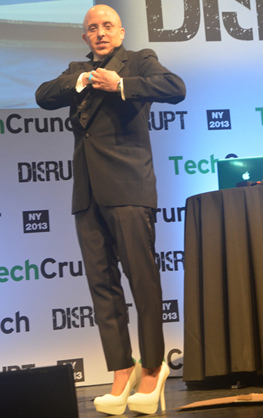 Here’s more awesome startup coverage from everywhere else, at TechCrunch Disrupt NY 2013. This Berlin Startup Has A Great Idea But Is The US Patient Enough For It?